Just tested NItrates with a new Salifert kit and they're at 25ppm. Edit: Just tested phosphates again using my Hannah ULR and they are at 0.012264 (4 / 1000 * 3.066). Algae growth has even slowed down since Saturday when they were 0.1ppm. I have been feeding one frozen cube daily. Last edited by Adrnalnrsh; 08/12/2015 at 06:45 PM. Question about dosing micro fauna: are Copepods and amphipods actively eating cyano, Dino's etc? Would it be better to not dose as much phytoplankton initially to force the pods to eat undesirable things like cyano, Dino's, algae? Copepods DO eat lots of dinos. You'd better add phytoplankton to make them breed like crazy. You need big numbers because dinos spread so quickly. I've never regretted buying pods. I've only regretted not buying enough. There are lots of species of dinoflagellates. Copepods might eat some or all species, but I wouldn't count on them fixing any large bloom, personally. That said, I like buying small animal cultures and stocking them as live food and for general cleanup. They probably will survive a dinoflagellate bloom. After this thread and reading more about plankton in general. I've now come to the conclusion that live phytoplankton and zooplankton are probably lacking in most reef Aquaria and are much more essential than I previously thought. Being the bottom of the food chain in the ocean it sort of makes sense now. Nothing is 100%, but my dinos are exploding; they're coating the walls of my tank. The worst patches are literally covered with various pods. 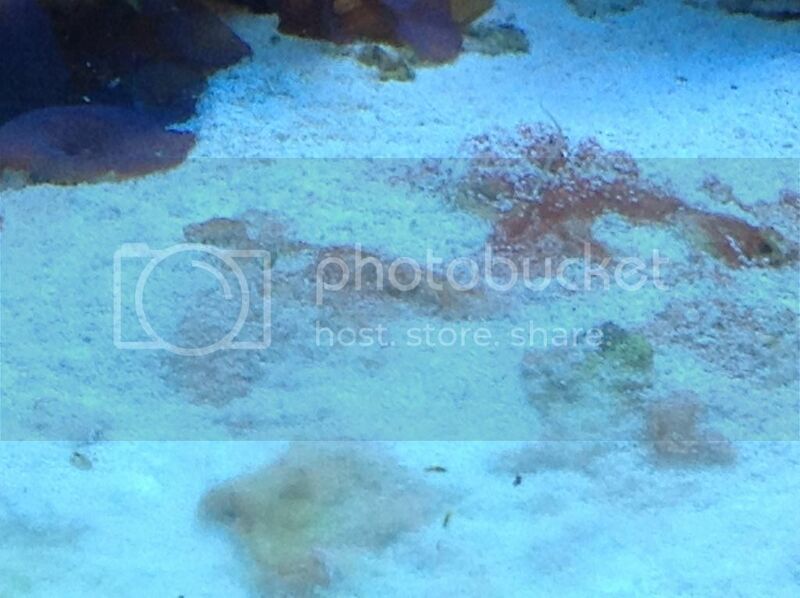 Speck like pods, copepods, ?amphipods, hydroids, etc. I have grammarus -looking shrimp running around too. They aren't killing off or even really reducing the dinos by any means, but they're alive in there. These aren't the commercially available ones. Actually aren't the tisbe/tigger pods detrivores anyway? I did lose pods (and dang near everything else) by repeatedly scraping off 2 inch thick coating of dinos on 3 aquarium walls. Don't try that at home. I read the entire thread. It's an epic. I totally feel DNA's pain. The thing about mixotrophic dinos is that they're predators that acquired the ability to photosynthesize, not autotrophs that evolved into predators. That's why if you treat O. ovata like algae, you lose. Recent studies have provided increasing evidence of a link between nutrient enrichment and harmful algal events (Hallegraeff 2010). However, in our study, although peak abundances coincided with a decrease in nutrient concentration, we did not observe a clear relationship between the bloom and nutrient concentrations; an observation supported by other studies (Vila et al. 2001; Shears and Ross 2009). This investigation shows that the removal of bacteria associated to O. cf. ovata unaffected cell yield algal cultures, while it appears to confer a higher cell number at mid stationary growth phase. This finding is in agreement with previous results reported for other toxic dinoflagellates (e.g. Uribe & Espejo, 2003; Green et al., 2010 and references therein), and it is reasonably due to the lack of bacteria-algal competition for nutrients, together with the absence of algal degradation by bacteria. ...but obviously that's not what's happening in our reef tanks. When O. ovata (or any dino) is nutrient-limited, it solves the problem the same way we do: by eating something. That's what's happening in our reef tanks. Think about it. What do you guys know about dinos? I've read that there are a number of symbiotic bacteria hosted in the dinos' mucilage. Remember the evolutionary history of the enemy: mixotrophic dinos are predators that acquired the ability to photosynthesize. These bacteria, the cyano... They're food. Dinos are no more symbiotic with them than people are symbiotic with cows. I mean, yes, we protect cows and we feed cows and we want cows to be fruitful and multiply, but that's because we eat cows. On paper, domestication is a big win for cattle -- there are lot more cows in the world than there would be if cows were free to gambol and frolic in a natural landscape filled with predators and diseases -- but the only benefit an individual cow derives from its relationship with humans is in the abstract philosophical sense that existence is better than nonexistence. We're the ones who benefit from that relationship, as dinos do from theirs. By combining the results of Jeong et al. (2005b) and Seong et al. (2006), I propose a possible mechanism of the outbreak and/or the persistence of offshore or oceanic red tides (Fig. 9); many MTDs [MixoTrophic Dinoflagellates] such as K. brevis, P. donghaiense, and P. minimum are able to feed on Synechococcus sp. and heterotrophic bacteria. Therefore, if the MTDs feed on some cyanobacteria which can conduct nitrogen fixation (e.g. Mitsui et al. 1986) and heterotrophic bacteria which usually have high P : N ratios (e.g. Tezuka 1990), the MTDs are able to obtain nitrogen and phosphorus simultaneously for their growth in offshore or oceanic waters. The dinoflagellate cells appeared to exercise some control on both the total density and distribution of the bacterial populations present in the respective culture flasks. Peak dinoflagellate culture growth rates (first 4 to 7 days of culture, Fig. 1) were associated with reduced numbers of bacteria directly associated with the dinoflagellate cells (Fig. 2), while peak relative dinoflagellate cell toxicity (Fig. 2, shaded area) was associated with a significantly increased fraction of closely associated bacteria. Later stages of culture growth (35 to 49 days) were marked by reductions in dinoflagellate cell toxicity and relatively uncontrolled increases in the total bacterial cell/dinoflagellate cell ratio. Increases in bacterial population densities associated with the decline of phytoplankton blooms have been reported elsewhere (10, 36). Results presented here show that bacterial genera associated with 0. lenticularis grown in clonal laboratory culture are not toxic when grown individually in pure culture. Marked increases in the proportion of these bacteria directly associated with the surfaces or extracellular matrices of these microalgal cells were correlated with the development of peak dinoflagellate toxicity during the static phase of their culture growth. Subsequent declines in dinoflagellate culture density and toxicity corresponded to uncontrolled increases in the total bacterial cell/dinoflagellate cell ratio and decreasing proportions of bacteria directly associated with Ostreopsis cells. These results suggest that associated bacterial flora may play a role in the phasic development of toxicity in laboratory growth cycles of these algal-bacterial consortia. In other words, not only are the dinos eating heterotrophic bacteria, they're farming their preferred food species of heterotrophic bacteria! >dinoflagellate cell ratio through 49 days of culture growth. That means that the dinos were running the show for the first month or so, but then they lost control and the system shifted to a state in which bacteria were ecologically dominant. What happened? >used to initiate the dinoflagellate cultures in this study. The dinos start off with plenty of food (over 70% of the bacteria in the flask) and eat their way through it in the first week, reproducing rapidly while their food bacteria drop to 10% of the bacterial population. The dinos respond to this crisis by producing poison to suppress competing bacteria and encourage the growth of their food bacteria. They're like farmers spraying weed killer to prevent competition for nutrients in the soil and maximize the growth of their crops, and the population of the dinos' bacterial "symbionts" rapidly recovers over the next two weeks to over 60% of the total bacterial population, preventing a crash in the dino population. Maximum measured toxicity comes at week 4, corresponding to a decline in the population of the dinos' associated bacteria to about 50% of the total population. The dinos have hit a point of diminishing returns. Metabolic waste products and the physical remains of dead dinos and bacteria are piling up in the mucilage -- all the stuff the dinos' bacteria can't eat -- and more and more poison is needed to keep unwanted bacteria away from that growing food resource, but now it looks like that strategy is failing and their food supply is threatened. At week 5, the dino population is declining. Interestingly, the population of dino-associated bacteria rebounds to over 80% of the total bacterial population -- in all likelihood by eating dead dinos. Even more interestingly, the dino population doesn't rebound along with their food supply, but instead continues to dwindle in weeks 6 and 7... Obviously, something has changed. Dinoflagellates are so delicate and easy to kill...it's only that in ideal conditions they reproduce very fast (both sexual and asexual) and can suffocate any system. The shift from a system dominated by dinos to a system dominated by bacteria resulted from eutrophication. In a weird way, it looks like ostis are in the same boat as we are -- they're battling eutrophy, too -- and I suspect this explains why "the dirty method" of dino control works. Getting a little sloppy with the housekeeping just helps nature take its course, moving up the eutrophic tipping point where opportunistic bacteria and protists can invade the mucilage and overrun the ostis' bacteria farm. What did you add? Food? Live rock? Love sand? Salt? Additive? Yes, my system was too ULNS and noticed important bacterial growth in the skimmate so I dumped the whole cup. Corals got very happy and extended polyps. One week later I noticed ostreopsis mucilage turning white and on the microscope I see millions of these microorganisms thriving. I have also been dosing large amounts of Ca(OH)2 keeping pH around 8,7 and put off CO2 input to the Ca reactor. So you're cultivating bacteria in your skimmate for a week and then adding it back in? That's the first I've ever read or heard of this. Anyone else? I've checked my skimmate under the microscope, seen some microbes and some dinos but never microbes attacking dinos, but I never let it culture for a week. I will let it culture and take another look. Not only bacteria but many other microorganisms like nematodes and ciliates. Skimmate is mainly water plus a Ca and Mg insoluble carbonates. It has no nitrate and little phosphate but can have SH2. My skimmate is ugly sludge that smells like feces. It varies from brown water with black sludge to yellow water with brown sludge depending on how wet I run it. Isn't the skimmate what we're using to export the dinos and is primary intended to remove DOCs? Do you let it settle and just pour the yellow liquid? Do you throw the brown chunks in? Break them up first? Monti - I'm not doubting you. I've just never heard about it so I want to know more. Yes, the same nasty stuff. I poured it in two times, one litre in the morning and one litre in the night, only the liquid, avoid solid chunks. What we want are the bacteria and microorganisms, not the solid inert stuff. The next day I watched cristal clear water, higher redox and many black poop from my turbo snails (they love it). Corals extended awesome polyps two days after pouring it. Turning skimmate into probiotic tea?!?!?!? Pure genius. Thanks, Montireef! On day 1 the skimmate was 7 days old. Day 1: 0,5 liters of skimmate added in the morning. Day 2: 0,5 liters of skimmate added in the morning. Day 3: 0,5 liters of skimmate added in the morning. Day 3: 0,5 liters of skimmate added in the afternoon. 2 liters in all added over 3 days. No reduction or increase was noticed in the dino population on the sandbed. In the last round I emptied the cup right after adding the skimmate. In less than an hour the skimmer had gathered around 0,5 liters of skimmate of similar transparency. Skimmate alone does not help against Ostreopsis dinoflagellates. If skimmers are really effective at removing an organism that prays on Ostreopsis, it's likely it can multiply in the skimmer cup so further tests are in order. Right now I 'd like to see if this will work with added live rock. It's been two weeks since I added more live rock and sand. Since there was no visible sign of anything positive after a week I did another test. I added a dead shrimp in a plastic mesh to the tank and let it rot. That has been going on for a week and now I'm on my second shrimp. This was done to see if the dinos disliked the additional ammonia. They don't seem to care at all, but there is a pleasant side effect going on. The rest of my SPS, fingernail sized brown leftovers, are showing their polyps for the first time in months. There is some color also showing in their tissue. I'm so sorry, DNA. I thought you had a chance. It looks to me like heterotrophic bacteria are the foundation on which ostis build. These bacteria are rich in phosphorous. Dinos are P-rich organisms, as well, but less so than the bacteria, so there's excess phosphorous in their diet. This waste phosphorous is used to recruit cyano, which is also P-rich, but less so than the dinos. And now the dinos have access to P from the bacteria and N and Fe from the cyano. Sky's the limit. I thought Montireef outcompeted the ostis' bacteria by triggering a minicycle when he added LR. A cycling bacterial biofilter is basically a series of overlapping bacteria blooms, during which nutrient demand is very high. Montireef's experience suggests that slowing the reproduction of the food bacteria by giving them some competition can cause an established dino population to eat itself out of house and home in a matter of days. The addition of a massive dose of heterotrophic bacteria and protists -- Montireef's probiotic zoom juice -- to the system thus seems like the perfect follow-up: the dinos, stressed and perhaps turning on each other because of the sudden scarcity of food, couldn't fight off the invasion. A combination of starvation, hungry protists and microfauna, and "algal degradation by bacteria" apparently overwhelmed the dinos. In essence, Montireef artificially tipped his system into a state where it was dominated by heterotrophs... It's the dirty method without the dirt. But DNA couldn't repeat the experiment. I wonder... Montireef reported snails pooping black for almost a week. Did your snails do that, too, DNA? I'm wondering if Montireef's skimmer was off when he dosed, and if you left yours on just that one time you checked the skimmate cup less than an hour after dosing, or if it was on every time...? The example of O. lenticularis suggests that benthic dinos secrete poison at least in part to control the population of bacteria around them to favor their preferred food species. If O. ovata is doing the same thing, then parachuting in a zillion tiny globs of colloidal organic carbon infested with heterotrophic bacteria and protists seems like it would be absolutely the last thing it wants. 34... If your chain of events is correct, how do you link the UV results? In my case, it was a rapid decimation of dinos . Maybe dead dinos become a good source for the competing bacteria and tips the scale. If that's the case, then UV alone would be more effective that UV and skimming? 34 Cygni, thanks for shedding light on several difficult issues. I've for long suspected bacteria to be a big player when it comes to dinos, but for reefkeepers they are hard to track for several reasons so they don't get discussed much here unless it's cyanobacteria. When it comes to cyanobacteria I've described it as a relationship and not being a symbiotic one. If I disrupt both the cyano and dinos. Dinos will settle in their usual spots first and then the cyano will settle on top. It's like the cyano is seeking out the dinos. It could also be the dinos are attracting the cyano for their benefit, but once this has taken place on the sand it can last for weeks. At least twice the end result has been a big reduction in dinos so one may think cyanobacteria to be a negative force on dinos. On the last occasion on the other hand only few weeks ago the cyano left and didn't leave a dent in the dinos that have stayed at max densities since. It seems like it's difficult for reefers and scientists to get the same results repeatedly or the dynamics and adaptations of the dinos are playing trics on us. Most scientist admit they don't know enough and further studies to be needed. A natural dino bloom has been described to have a rubber band effect with the predators in tow. The predators will always catch up and the bloom will reside. In my closed ecosystem there has been a constant mild bloom for years and predators have never got the upper hand. Unfortunately this law of nature does not apply in my reef tank, but still my bloom has not exceeded mild for a long time. I kept my skimmer running after pouring the skimmate in. I think it's mostly the toxins rather than the cells that are doing harm, but when is it produced and does skimming or charcoal help? Shutting them off may give a rise to the toxins and put livestock in danger. At the time I had some SPS doing alright so I opted against it. I only have astrea snails and they stay off of dinos. Since 34Cygni is not in a galaxy far, far away... I hope to see more of your rays around here. Thanks. Thread was already a must-read before that post. Great job. Alright - just picked up an emperor aquatics 40 watt uv. I have a feeling that most people who haven't had luck with UV underpowered their UV relative to the size of their tank. My tank is 140 gallons. I'll report back in a couple of days as to how it's going! Update - I've been having some success with my UV but it has not entirely wiped out the Dino's. I do think it has thinned them and definitely slowed any new ones from growing. One big item where I see improvement is over the back wall. The tank has a pretty big cleanup/water change last weekend and the back wall is still relatively clear. Before the UV the back wall would have had a good coating on it. One item I forgot to mention. I said I have an emperor aquatics 40 watt UV. That was incorrect. I have the 40 watt lite so my flow might still be a little too fast through it. In the process of a week long blackout and dosing h2o2.....when I briefly turn the lights on my water looks disgusting. ....plan on going a week blues and slowly raising my lights from 3 hrs at 30 percent after the blackout....today started a syphon through a filter sock on top of skimming...I could see them flying around in my water column....as soon as I turned lights on they started attaching...all the while dosing h2o2 and running carbon and a gfo reactor...I have a small system but would not like to start from scratch but I'm at my wits end. I haven't given a lot of thought to "the clean method", as it seems like how it works is straightforward enough, and my bias is towards bioremediation. But I fully understand that other hobbyists are into technological fixes, and I expect that if marine permaculture is possible, it'll be a thoughtful combination of these two different approaches that makes it work. So I'll take a stab at it. It's certainly possible that lysing dinos and bacterioplankton and whatever else are releasing significant amounts of dissolved organic carbon into the system, as well as cellular detritus that gets skimmed off. This DOC would fuel the growth of heterotrophic bacteria and could perhaps result in the disruption of the dinos' little bacteria farms, but it could also fuel the little bacteria farms... In any case, Occam's Razor says that UVS is killing the free-swimming dinos, which are the adult dinos, meaning you're killing off most of the reproducing population -- fewer grown-ups means fewer babies. But on the other hand, slow-flow UV sterilizes the heck out of the water column, which means that way fewer random bacteria and protists are floating around that could potentially get into the dinos' bacteria farms. Additionally, one of the papers I read mentioned that adding a solution of dissolved organic carbon extracted from red algae speeds up the growth of dinos in vitro -- like I said, DOC could also fuel the little bacteria farms... However, I don't know if this applies in axenic cultures or not, meaning I don't know if DOC boosts dino growth by boosting bacteria growth, or if dinos can directly absorb dissolved organic carbon from the water. There are hints that they can, and it makes sense that they can to at least some extent, given that they can utilize NO3 and PO4 directly from the water, but I haven't found proof. Anyway, UV looks like a double-edged sword to me: it controls the dino population, but it may also help protect and nurture the survivors. I hope that's helpful. "unlike the predators, the dinos can encyst and wait for the predators extinction, and then grow to plague proportions without any biological controls"
Almost one month later I am spotting some ostreopsis cells on the microscope. They were gone, but now they are back. Really? Is your UV still online? The possibility that dinos could evolve UV resistance should not be dismissed out of hand. Everyone knows that dinos have an extensive bag of biochemical tricks to work with, and the reason for this is that they have honkin' huge genomes. The smallest dino genomes are larger than our own, and the largest known have an order of magnitude more DNA base pairs than we do. Dinos seem to be DNA hoarders, and given that C. taxifolia -- the seaweed that ate the Mediterranean -- came out of an aquarium, it's even crossed my mind that the invasive variant of O. ovata that's burning up the Med and the waters around Korea and Japan could have come out of a marine aquarium. UV resistant dinos would be bad. Imagine UV resistant O. ovata adapting to the intertidal zone. Just thought that should be on the table, that's all. LOL. My pleasure. I hope I can help, though do bear in mind that the foe in our crosshairs is one of the three main primary producers responsible for generating most of the biomass in modern marine ecosystems, the other two being diatoms and coccolithophores. That's why Quiet_Ivy has 2" of dino goo on her glass (I am in awe of that, BTW -- never seen it that bad). We are hunting big game, here, and failure is to be expected. The dinos are creating a phosphorous-rich microenvironment to recruit cyano. This kind of thing is very, very, very ancient behavior among single-celled organisms -- the Earth's ecology consisted of nothing but single-celled organisms for billions of years, and the highest evolutionary form they reached was a bacterial mat, a sort of bacterial biofilm on steroids in which a layer cake of many different microorganisms grow one on top of the other, passing nutrients from layer to another in a more or less cooperative manner. Bacterial mats are now rare outside of unusual environments like hot springs and hypersaline pools, but you can still see an echo of Earth's ancient ecosystem in a Winogradsky column, or in Shark Bay, Australia, or in the underlying microbiology of a deep sand bed. Dinos also feed their "symbiotic" bacteria with simple organic carbon molecules that are like french fries for the bacteria -- not a lot of nutrition there, but a lot of calories. A lot of energy. All photoautotrophs seem to do this. When terrestrial plants are nutrient-limited, for example, they trade excess sugar generated by photosynthesis to fungi and bacteria in the soil in exchange for nutrients. Algaes do the same thing -- it's normal to find a few heterotrophic bacteria clinging onto the surface of individual phytoplankton cells, for example. once this has taken place on the sand it can last for weeks. At least twice the end result has been a big reduction in dinos so one may think cyanobacteria to be a negative force on dinos. In my experience, the three-dimensional structures in which algaes present, whether it's a stringy mass of bubbly goo or a green shag carpet, are detritus traps to gather organic matter for their associated bacteria to break down, releasing nutrients that the algae needs. This, too, is an ancient strategy for gathering nutrients which was employed for billions of years by bacteria -- mature cyanobacterial mats, for example, are "phosphorous pumps" which trap so much detritus that even amidst a bunch of P-rich organisms like cyano and heterotrophic bacteria, there's excess PO4 generated by the bacterial decomposition of organic material. PO4 is practically insoluble in oxygenated seawater, so instead of being released into the water column, most of the excess PO4 diffuses out the bottom of the mat, into the anoxic water in the seafloor sediments. Perhaps the cyano growing atop your ostis is sometimes able to collect enough detritus to contaminate the dinos' bacteria farm or attract other, hungrier protists and microfauna that quietly ate their way through the dino bloom. Other possibilities that occur to me are that the cyano grew so thick and lush that it prevented the dinos from photosynthesizing effectively, or that the cyano produced toxins of its own and fought back. However, it seems unlikely that cyano would be able to shade out the dinos, as dinos (like all freshwater and marine algaes that I'm aware of) can adjust their photosynthesis machinery to work with less light. It also seems unlikely that dinos would recruit a species of cyano that could poison them -- behavior like that should be edited out of the species by evolution. Thus, it appears that letting the cyano grow may be another backdoor route to "the dirty method", like Montireef's probiotic tea. That paper proposing that mixotrophic dinos obtain P from bacteria and N from cyano dates from 2010, and it's apparently the first time the idea was put in print -- or at least the first time the lead author of the paper was aware of it being put in print, as he used the phrase "I propose a possible mechanism". That was just 5 years ago. Think about it: we're about as close to the cutting edge of science as reefers are ever likely to get. If we finally have a viable mental model of what's going on, we finally have a chance -- maybe not a big one, but a chance just the same -- to think our way through this thing. Yes, that's broadly true of trophic relationships across all ecosystems at every level. Fluctuations in the population of bunnies will "rubber band" the populations of predators that feed on rabbits, for example, and the population of bunnies fluctuates in part because they're being "rubber banded" by the changing fortunes of the plants they eat (for example, less rain = less plants = less bunnies). An ecosystem can be viewed as a rat's nest of interlocking feedback loops with no true equilibrium point. It's the toxins that trouble me. Of course, GAC saves the day, and this hobby requires so many consumables already that what's one more? But I don't like to see hobbyists stuck on yet another treadmill, especially when an equipment failure could potentially cause real heartbreak, or even pose a health risk. I didn't see much discussion here about the toxins produced by these guys and wanted to make sure everyone is taking proper precautions. Ostreopsis sp. makes palytoxin. This is a toxin all reefers should be familiar with as palythoas and zoanthids produce this toxin and there are stories every year of hobbyists nearly killing themselves by mishandling these corals. Amphidinium isn't really thought of as highly toxic, but I've talked to too many reefers with Amphidinium blooms who have experienced personal health effects when killing these that I think we should treat Amphidinium with respect as well. The dinos won't release the toxin until they die, so before starting any eradication procedures you should make sure the area around the tank is well ventilated, and have carbon ready to run. It would be a good idea to keep everyone (including other pets) away from the tank and wear gloves and a mask if you are getting a lot of dino die off. If Montireef confirms that his skimmer was off, I encourage you to try again, this time following the Montireef Protocol. I understand your reluctance. Saltwater hobbyists are often brimming with energy, invention, and inquisitiveness, but at the same time the more deeply invested we are in our systems -- not just in terms of time and energy and money, but emotionally invested, as well -- the more conservative we become. We don't want to put at risk all that we have accomplished, to say nothing of livestock that we're proud of or sentimental about. But I submit that if you're ever going to try it, now's the time. Reason one: Your new LR and sand is probably still cycling. Maybe this is important, maybe it isn't. Let's worry about that later. Reason two: You've made your corals, and in particular their zooxanthellic symbionts (...which are dinos, do bear in mind) very happy with all that nitrogen you've released into the system. Corals keep their symbionts nitrogen-limited to force them to pump out sugar, and as much as half of this sugar goes towards making mucous -- which sounds a little disgusting until you consider that mucous is the front line of coral's immune system. They secrete mucous to lift bacteria off their surface, and then release the mucous into the water, and the bacteria drift harmlessly away. Right now, your corals' symbionts are PUMPED! They've finally gotten the nitrogen they crave -- that's why they colored up. The corals may even have let them have enough nitrogen to multiply. With all those healthy, happy symbionts, your corals are in about as good a position to protect themselves from an onslaught of bacteria as they ever will be. Reason three: If Montireef dosed with his skimmer off, then you've proven that the Montireef Protocol doesn't work with the skimmer on. That's useful information. The obvious next experiment to try is to test whether or not the skimmer really is the variable by dosing again with it off, and only you can do that experiment because it should be run in the same system under similar conditions. Did you miss the possible cure for Ostreopsis dinoflagellates? Montireefs claims need to be repeated by several third parties. He got rid of them with two kilos of fresh live rock and 2 liters of skimmate. With donated tank water two more reefers got rid of them as well. He's got videos to back up what seems to be microbes attacking the dinos. He's identified his dinos with a microscope. Drop your gut feeling and let's prove if this really works. I ask you to accept your own advice. Reason five: Curiosity. Just simple curiosity. And, of course, if Montireef pops up and says, "I don't know what you're talking about, 34cygni -- my skimmer was on the whole time" then I wasted my time composing all that and will feel duly embarrassed. But that black snail poop... I just have a feeling his skimmer was off, and I'm willing to go out on a limb occasionally looking for the leverage to push the hobby forward another inch or two. The dinos are free floating in the dark, but set up farms in the light. The nitrifying bacteria are predominately not free floating. They're resident in sand beds and inside rock structures. Every night, the dinos float kills them. The skimmer and nitrifying bacteria export/consume their remains. This strengthens the good bacteria. I don't see UV as kill or cure with chance determining the outcome. The day/night transition in dino behavior determines the ultimate outcome. As far as UV resistance, I'm sure dinos have had a few million years of the sun's UV C at their back. As far as techie solutions, most of us are thankful that we have them. Modern medicine makes excellent use of them. So why not the reef? Good bacteria vs. bad bacteria is real, but so are the implements of hygiene and diet to promote the good. The possibility that dinos could evolve UV resistance should not be dismissed out of hand. You need to change the UV regularly if you're using continuously. As well as cleaning it. I'm discouraged. My tank is in a holding pattern. I'm feeding phyto, and enough pellets/mysis for an imaginary clownfish. I have *maybe* 0.2 nitrates, undetectable phosphate (Salifert for both). Skimmer is producing 30mL to 60mL a week, set at max wet. (I'm collecting it in a bottle a la Montireef) There's no other algae. The dinos on the sandbed have been replaced by cyano. Or a mix. It's difficult to tell. The dinos on the glass aren't going away. I get a white fog on the glass which eventually turns yellow and develops the odd spot pattern of dinos. Where's the green algae? Diatoms? Anybody? Looking at my monthly tank shots I see that my sandbed is becoming less and less alive. There aren't any hair worms along the front at all anymore. No spaghetti worms in the sandbed. Pod population has come back to normal, and seems to hang out on the glass in the dinos. Sandbed is clumping into little hillocks, oddly. I am very hesitant to add fish or inverts back as I don't really know what the toxin level is. Here's a sandbed pic. Can't really tell if that's dinos mixed in the cyano or what. The green isn't algae, it's a different strain of cyano. The blurry trio at the bottom center are green pods. I'd really like to know what was going on in Montireef's cultured skimmate. Were conditions anoxic/anaerobic? Did the bottle contain the motherload of n-fixing bacteria? Or was it the protozoan predators? Oh and the 2" coat of dinoflagellates was more neglect than severity of infestation. I had literally never heard of dinos being a problem in captive systems and assumed I was seeing normal algal sucession in a new tank. I'm a 'wait and see' aquarium keeper so I didn't panic until things started dying. Have you considered planting a large mass of chaeto or grape caulerpa? Maybe get a green hair algae rock from a local reef keeper or store? I think my chaeto and DSB refugium was a strong contributor to my health during the recovery. Last edited by Adrnalnrsh; 08/17/2015 at 09:15 PM.